Veteran spacewalkers Shane Kimbrough and Peggy Whitson ventured outside for six hours and 32 minutes, installing a series of three adapter plates to connect new Li-Ion batteries that were installed by the Station’s robots earlier in the week. All batteries were successfully integrated into Power Channel 3A, marking the first of eight power channels to transition to the new batteries with the next to follow in the coming week via more extensive robotics work and another spacewalk set for January 13. All electric power on the Space Station is generated by the station’s four iconic solar array wings which transform sunlight in electricity and feed the various systems of the complex plus a number of batteries tasked with powering the station when passing through orbital night – on average 35 minutes per orbit around the Earth, 16 times per day. This places great demands on the Station’s batteries, quickly accumulating a great number of charge-discharge cycles. 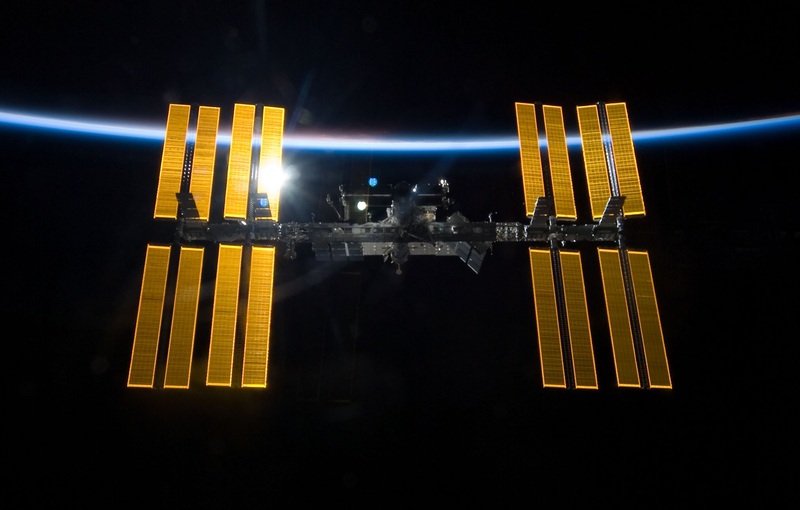 Given the number of cycles experienced by the batteries and the long lifetime of ISS, a replacement of batteries had always been planned around the mid-point of the station’s operational life. This replacement will unfold over a period of four years with new batteries being delivered in batches by Japan’s HTV cargo spacecraft to revamp two of the Station’s eight power channels at a time. In total, the Space Station’s previous battery system hosted 48 Nickel-Hydrogen batteries that were considered state of the art when the Station was built due to their robust, long-lifetime design without major degradation and intrinsic over-charging protection. Each of the 169-Kilogram Ni-H batteries consists of 38 individual cells – pressure vessels that hold gaseous Hydrogen at high pressure created in the charging process. With the battery replacement on the horizon, NASA decided to take this opportunity and replace the Ni-H technology with Lithium-Ion batteries that have become the new standard for almost all spaceflight applications and are also omni-present in consumer electronics on Earth. Li-Ion batteries have a higher energy density than Ni-H batteries but are less robust and require a number of safeguards to protect against over-charging and excessive heating. All of the Station’s batteries had already outlived their original service lives of 6.5 years. The oldest truss segment, P6 out on the port side, was launched back in 2000 but had its batteries replaced in 2009 & 10 while the P4, S4 and S6 trusses had their batteries installed ever since being launched in 2006, 07 and 09. 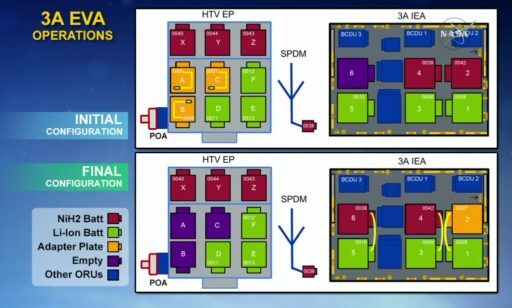 The replacement batteries will sustain the Station out to its end-of-service date currently standing at 2024 but quite possibly going beyond that into the second half of the next decade. 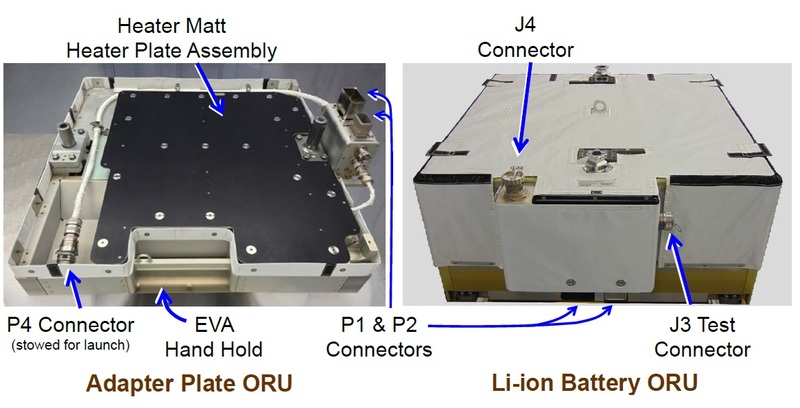 The new Li-Ion Battery Orbital Replacement Units (ORUs) have been built by Aerojet Rocketdyne using thirty Japanese-built Li-Ion battery cells per battery assembly. In terms of capacity, each of the Li-Ion batteries can replace a pair of Ni-H batteries – cutting the number of launches in half and simplifying the station’s power system going into the future, also eliminating a regular conditioning process on the batteries to mitigate ‘battery memory’ on the Ni-H units. One drawback of the new Li-Ion technology is a shorter life span than the durable Ni-H batteries, but the ORUs flown to ISS have undergone rigorous certification testing and will be able to support 60,000 cycles – corresponding to ten years of operation. A number of safeguards are part of the new batteries to protect against ‘thermal runaway’ issues as the batteries are similar in design to the Boeing 787 batteries that made the news when suffering from significant overheating problems. Internally, each battery comprises three ten-cell banks plus a control unit with two redundant controls monitoring temperatures of each cell and providing circuit protection. The Li-Ion ORUs are built to the same form factor used by the Ni-H batteries – 104 by 94 by 48 centimeters, weighing in at 197 Kilograms a piece. A single Li-Ion battery replaces the function of two Ni-H batteries that were connected in series to a Battery Charge/Discharge Unit. Therefore, special Adapter Plates were fabricated to connect the single Li-Ion battery to through the interfaces for the unneeded second battery in each string to complete the electrical & data circuitry. The replacement effort is completed one power channel at a time – requiring six Ni-H batteries to be replaced with three Li-Ion ORUs and three Adapter Plates. The first batch of batteries is being put in place on the S4 truss of ISS, feeding power channels 3A and 1A. 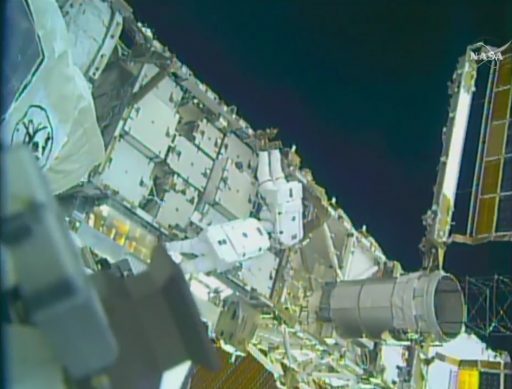 All batteries, along with other power conditioning & switching units, reside on what is known as the Integrated Equipment Assembly (IEA) that was the focus of attention during Friday’s EVA and extensive robotics completed in advance of the spacewalk. 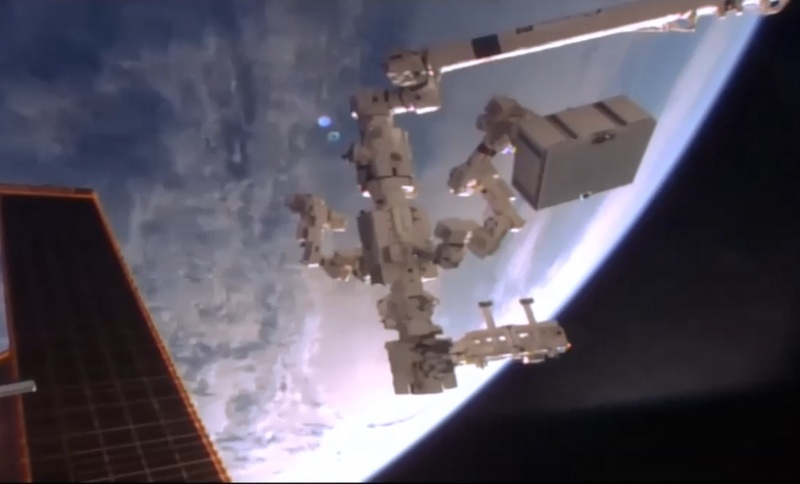 The replacement work is shared by spacewalking crew members and the Station’s robotic duo, the 17-meter Canadarm2 and the two-armed Dextre robot also known as the Station’s handyman. Without the robots doing most of the heavy battery replacement work, six EVAs would be required to complete the work on two power channels illustrating how the inauguration of robotics into external maintenance reduces dependency on the crew and frees up valuable time for ISS science operations. Dextre and Canadarm2 were in action starting New Year’s Eve to remove four of the six old Ni-H batteries from the 3A side of the IEA and move them to their disposal locations on the Exposed Pallet of the HTV cargo craft that facilitated six Li-Ion ORUs for launch and will take up nine discarded Ni-H batteries for disposal. The robots installed three Li-Ion ORUs in Slots 1, 3 and 5 of the IEA with Slot 6 empty and Slots 2 & 4 still occupied by old Ni-H batteries. For U.S. EVA-38, the spacewalkers were tasked with finishing the battery integration by installing three Adapter Plates on the IEA to bridge electrical connections between the new batteries and their Charge/Discharge Units. 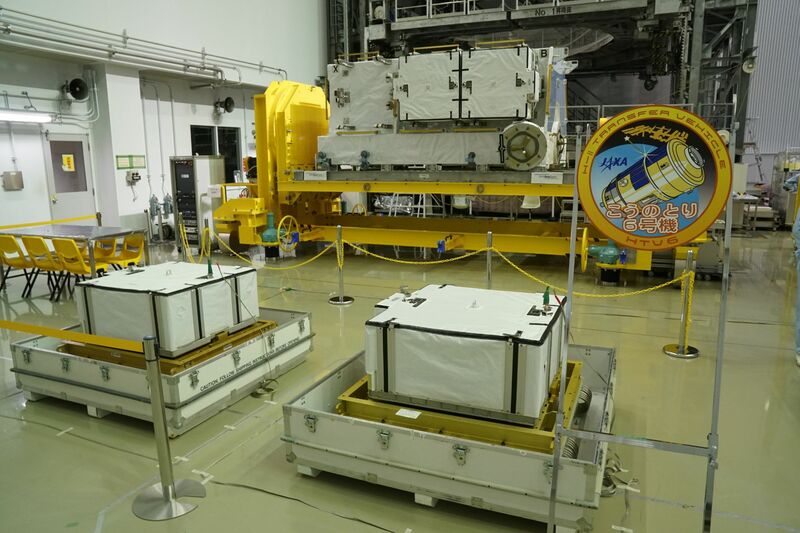 The two crew members also were to move the two remaining Ni-H batteries to positions atop the adapter plates and hook up data lines to the new Li-Ion batteries. 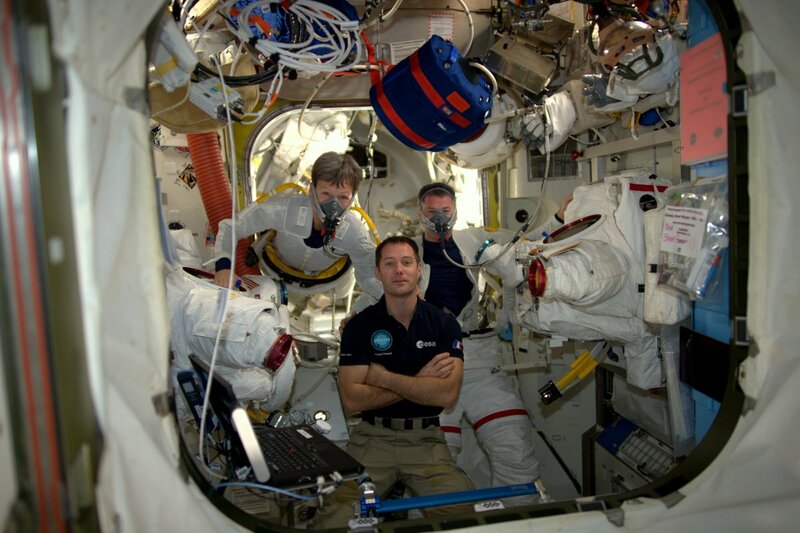 The two spacewalkers started their long day of work bright and early on Friday with a checkout of their Extravehicular Mobility Units ahead of a multi-hour suit-up and pre-breathe operation assisted by ESA Astronaut Thomas Pesquet and Russian crew member Oleg Novitskiy who sealed the Astronauts off in the Quest airlock to send them on their excursion. 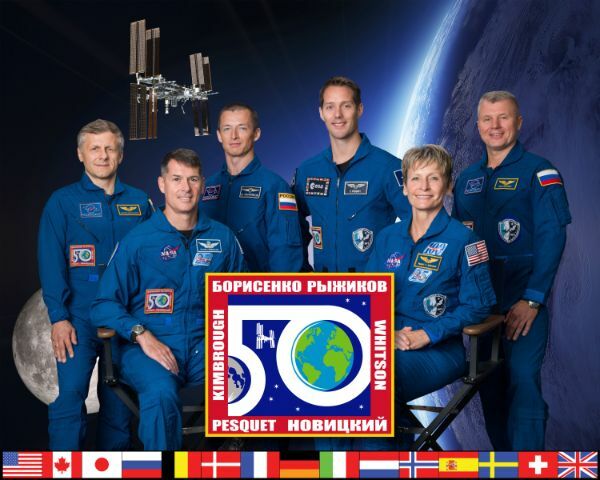 A smooth depressurization set the stage for the opening of the outer hatch and the transition of the space suits to battery power, marked at 12:23 UTC and signaling the formal beginning of the spacewalk. 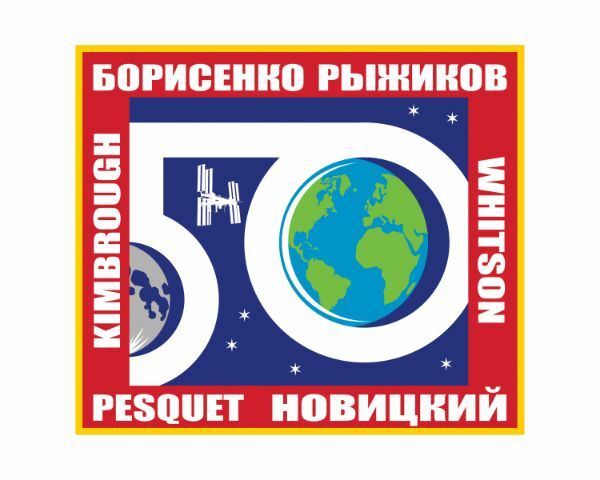 Shane Kimbrough was first to exit the airlock followed by Peggy Whitson along with a pair of tool bags carried to the outside for the lengthy battery task. 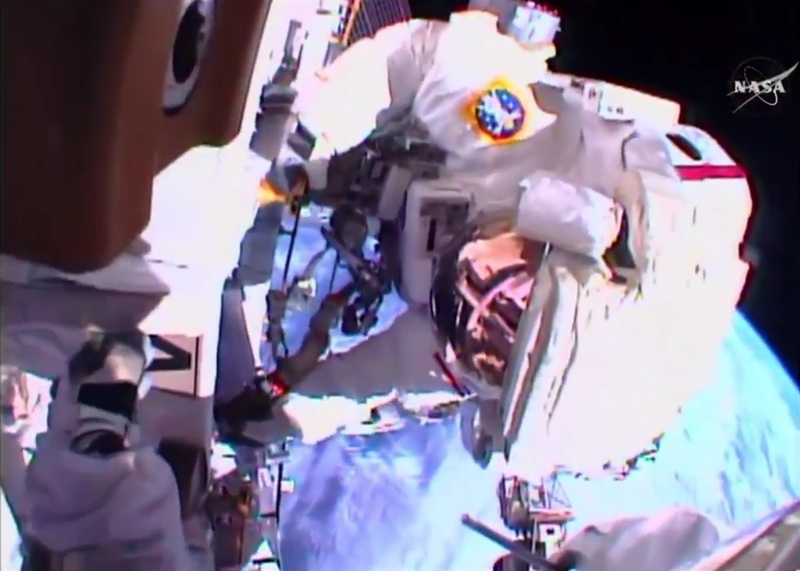 After the usual suit checks, the two veteran spacewalkers parted ways with Kimbrough headed to the S4 IEA where he set up shop by installing a foot restraint and placing a handling device on one of the old Ni-H batteries. Meanwhile, Whitson climbed over onto the Exposed Pallet where she employed a ratchet wrench to break torque on the six structural bolts holding the three Adapter Plates in place on the pallet. She was then joined by Kimbrough and the two worked with their Pistol Grip Tools to release a pair of 39-Kilogram Adapter Plates they then carried over to the IEA for installation. 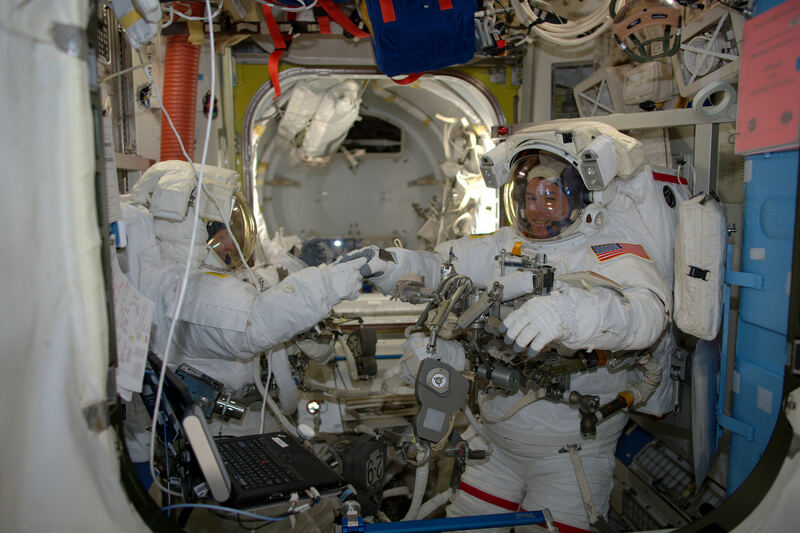 Once at S4, the two spacewalkers wasted no time and installed Adapter Plate A in Slot 6 of the 3A IEA by driving a pair of structural bolts. The electrical circuit between the Slot 5 Li-Ion battery and its charge/discharge unit was closed by means of blind-mate connectors on the back of the adapter plate and the data circuitry was established with a jumper cable installed by the crew between adapter and battery. Electrical Systems Officers at Mission Control quickly confirmed good connectivity to the battery, giving ISS its first Li-Ion battery. 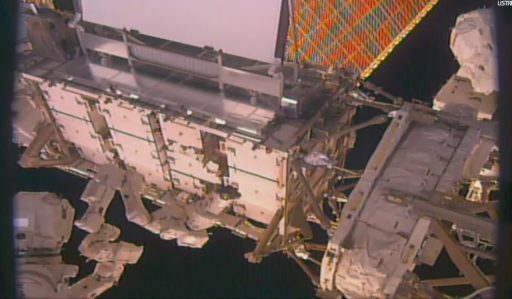 Next up for the spacewalkers was freeing up Slot 4 on the IEA by removing the Ni-H battery and installing it atop the Adapter Plate that had just been placed in Slot 6. Shane Kimbrough released the battery via its primary bolt and then mounted it atop the adapter by engaging both structural bolts. The empty Slot 4 enabled the crew to put in place the second adapter plate, also mating the P4 data link cable to fully integrate the second Li-Ion battery into the 3A channel. 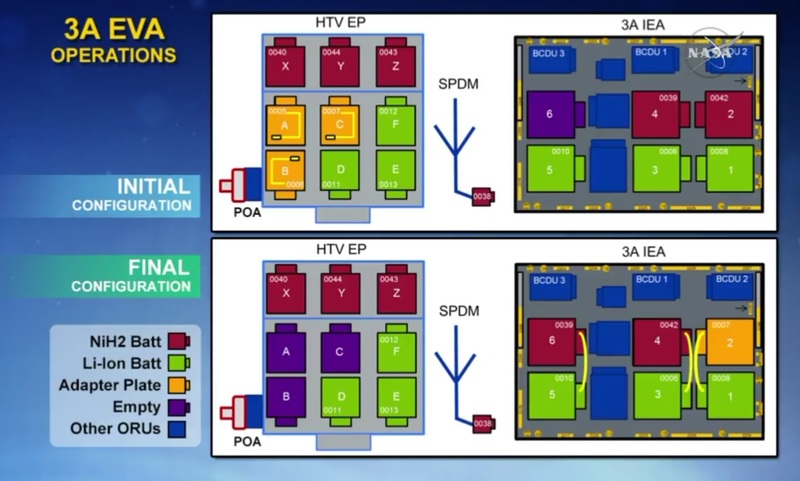 Mission Control confirmed good connectivity to both 3A batteries – considered the minimal operational configuration of the channel and marking the base objective of the EVA. The crew continued working at a fast pace, removing the Ni-H battery from Slot 2 and bolting it onto Adapter Plate B to free up the final slot on the IEA for the third adapter plate. 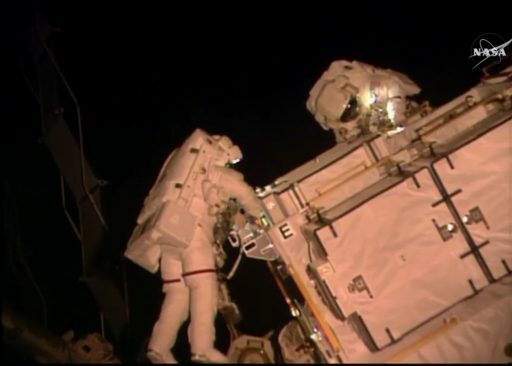 The last of the Adapter Plates to be installed during EVA-38 was still attached to the Exposed Pallet – requiring the two spacewalkers to backtrack and fetch the adapter before installing it in Slot 2 of the 3A IEA. 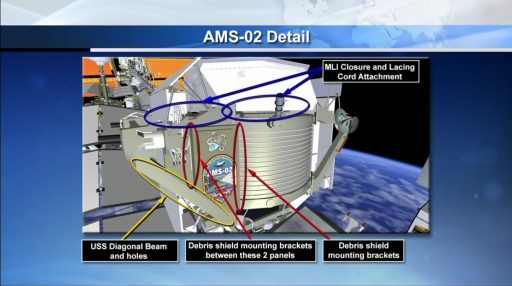 Once the adapter was hooked up to data circuitry, Mission Control was able to confirm good health of the Li-Ion battery – giving ISS its first power channel purely driven by Li-Ion-based batteries, a major milestone in the ongoing outfitting effort to revamp ISS with modern systems among which are state-of-the-art computers, high-data rate communications, and external HD cameras. Although work appeared tedious with multiple attempts needed at seating both, the adapters and batteries, the astronauts made quick work with adapter C in place just around the four-hour mark into the EVA. 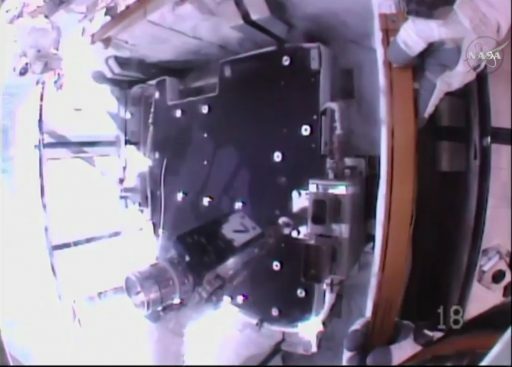 To tie up some loose ends on the IEA, Peggy Whitson used the Pistol Grip Tool to fully engage secondary bolt H1 on Battery 1 which could not be completed by the Dextre robot. Meanwhile, Shane Kimbrough moved to the other side of the IEA where the 1A power channel is facilitated. There, he broke torque on the Ni-H Slot 2 battery which was not possible robotically back in April. With all scheduled tasks complete, the crew went on to some get-ahead tasks from a pretty full job jar containing activities left open on previous spacewalks. 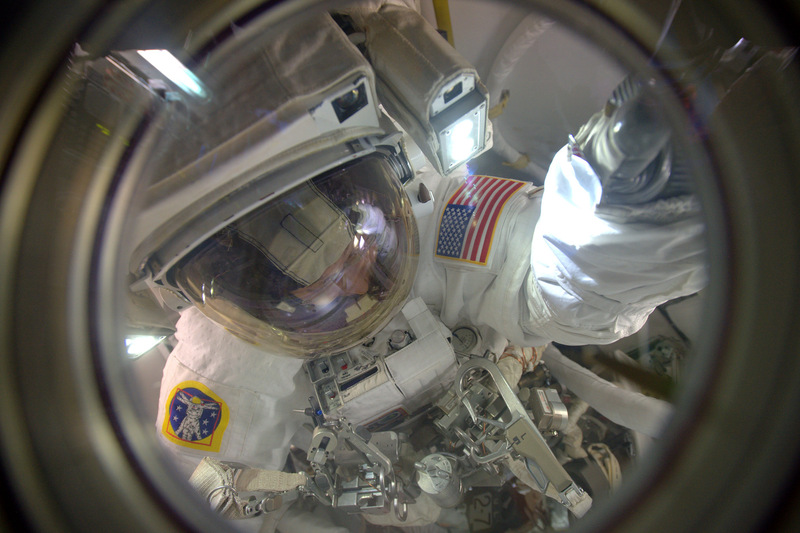 Parting ways with his EVA partner, Shane Kimbrough headed outboard on the Station’s truss and climbed onto an Express Logistics Carrier to have a good view for a photographic survey of the Alpha Magnetic Spectrometer to aid engineers on the ground in developing a spacewalk to outfit the Station’s primary particle physics instrument. Over recent years, the AMS has shown unfavorable trends in some of its instrument temperatures due to degradation of its insulation. To extend the operational life of the dark matter hunter, NASA is planning to re-fit the instrument with new thermal blankets and other protective equipment – requiring a close-up look at the current state via the photos collected by Kimbrough. In the meantime, Peggy Whitson moved to the airlock to the S3 CETA (Crew/Equipment Translation Aid) Cart where a broken lighting fixture was to be removed for replacement on a future EVA. This relatively simple task turned into the most complicated undertaking of the EVA – taking both crew members to release the single stanchion bolt holding the light in place. A final get ahead task tackled by the crew was routing a bundle of three Ethernet Cables from the so-called rat’s nest on the Z1 truss to the inside of the S0 truss to set up for the installation of Enhanced Processor & Integrated Communications (EPIC) Multiplexers/Demultiplexers (MDMs) for data communications with future Commercial Crew Vehicles traveling to ISS. 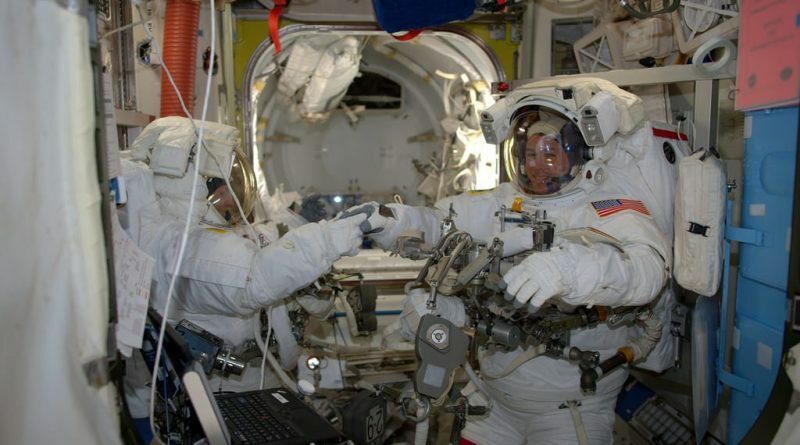 Having blazed through their primary task list and checking off three important get-aheads, the spacewalkers returned to the airlock to end the EVA in orderly fashion with a tool inventory before heading back inside. The EVA ended after six hours and 32 minutes when repressurization of the Quest airlock began. Operations ongoing aboard the orbiting complex will remain extremely busy for the next week with another batch of robotics lined up for January 8 through 12 to complete the battery replacement on the 1A side of the S4 Integrated Equipment Assembly, gearing up for a January 13 EVA by Shane Kimbrough and Thomas Pesquet. Next week’s EVA will look similar to Friday’s activities with the crew installing three adapter plates to fully outfit the second power channel with new Li-Ion battery technology. Friday’s spacewalk was the 196th dedicated to ISS Assembly and Maintenance, totaling 1,224 hours. For Shane Kimbrough, it was the third career EVA and he now stands at a total of 19 hours and 24 minutes. Peggy Whitson now has seven career EVAs under her belt, tied with Suni Williams for the most spacewalks performed by a female Astronaut. Her new total stands at 46 hours and 18 minutes.